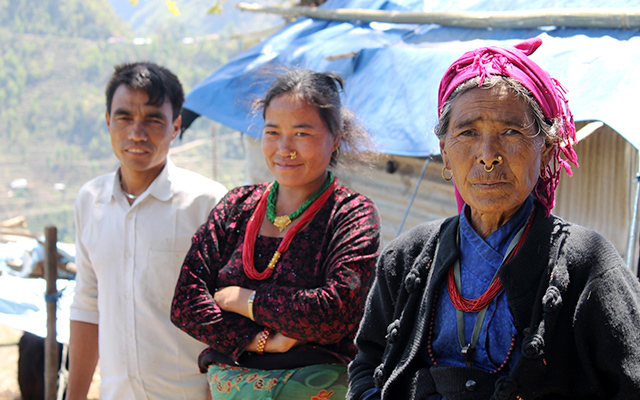 Nirjala, who was 18 when she was interviewed by UNU-EHS researchers, now lives with her family, along with nine other affected households, in tents located in an abandoned factory. As well as making her homeless, the landslide of August 2014 also destroyed her school, plus it destroyed the family paddy field, which was their main source of income. Still, Nirjala feels lucky to have survived at all. With a death toll of 156, this was one of the deadliest landslides in Nepal’s history, and innovative new research by UNU-EHS experts has revealed the range and extent of the loss and damage it caused to hundreds of households. In all, the scientific lead Dr. Kees van der Geest of UNU-EHS surveyed 234 households to gain an understanding of the wide range of economic and non-economic losses and damages sustained by the households in the area as a direct result of the landslide. The study also looked into the effectiveness of the various preventative and coping measures adopted by the respondents, and analyzed what might have stopped households from doing more to protect themselves. One of the most severe impacts of the landslide was damage to or loss of land. Two thirds of the respondents (68%) estimated the losses and damages to land for their households at more than USD1,000 and for over half of this group, the losses were more than USD10,000. The research also found that respondents with an annual income of less than USD1,000 incurred median losses of around USD6,000, equivalent to 14 times the average annual income, whereas respondents with an annual income of more than USD2,000 had median losses of more than USD10,000, which was roughly three times their annual income on average. Indeed, for Dr. van der Geest, examining what communities were doing to minimize the potential consequences of a natural event such as a landslide, flooding or earthquake, was just as important as assessing the loss and damage caused when disaster did strike. Notably, the study found that a majority (65%) of households had adopted preventive measures prior to the 2014 landslide. Livelihood diversification was found to be the most common tactic for minimising any potential losses and damages, with 41 per cent of households finding new ways of earning money to supplement income from agriculture. Meanwhile, around four in 10 households were found to have placed physical barriers around their properties so as to protect them from natural events – though, again, in many cases, despite people’s best efforts, this was simply not enough. Indeed, while one of the most common preventive measures, the installation of physical barriers was found to be one of the least successful, particularly when compared to house adjustments and pro-active migration. The Nepal Loss and Damage Case Study was launched at COP22 in Marrakesh, Morocco.